A natural vegetable dye is used to darken the eyebrows and lashes to make them more defined. An eye lash tint can make the eyelashes look fuller and longer, thus eliminating the need for mascara. 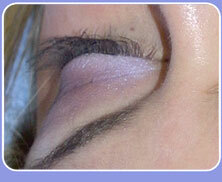 Eyes look brighter and are even further enhanced when the lashes are permed.